Feverfew (Tanacetum parthenium) extracts are used widely in the United Kingdom and Germany. 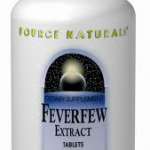 Feverfew works by inhibiting human blood aggregation and serotonin secretion. In a double-blind, placebo controlled crossover study conducted in Israel, 57 patients were selected at random and divided into two groups. Both groups were treated with feverfew in the initial phase lasting two months. During the second and third phases, a double-blind, crossover study was conducted. The results showed that feverfew caused a significant reduction in pain intensity compared with placebo. Symptoms, such as vomiting, nausea, and sensitivity to noise and light, were also dramatically reduced (Palevitch et al. 1997). An earlier randomized double-blind, placebo-controlled crossover study was conducted with 72 volunteers. 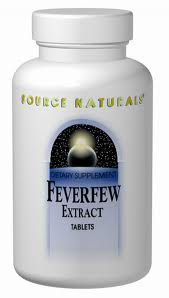 At the completion of the trial, 59 patients had remained in the study; from their daily diaries and medical testing, it was found that “Treatment with feverfew was associated with a reduction in the mean number and severity of attacks (and a reduction in)… the degree of vomiting…Scores also indicated a significant improvement with feverfew. There were no serious side effects” (Murphy et al. 1988). In addition, no serious side effects have been reported with the use of feverfew, although people that are allergic to ragweed or related plants should not use feverfew because of the possibility of allergic reaction. 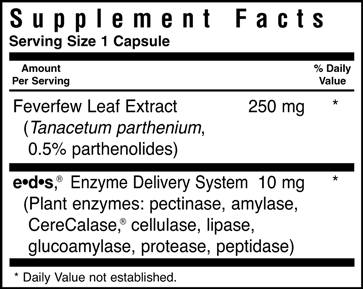 If you are going to use a feverfew product, look for whole leaf, preferably encapsulated products that are standardized to 0.20%-0.50% parthenolide; the standard dose is 100-250 mg standardized feverfew extract daily.